Synopsis: Academy Award winner Angelina Jolie directs and produces Unbroken, an epic drama that follows the incredible life of Olympian and war hero Louis “Louie” Zamperini (Jack O’Connell) who, along with two other crewmen, survived in a raft for 47 days after a near-fatal plane crash in WWII-only to be caught by the Japanese Navy and sent to a prisoner-of-war camp. A couple of years ago, Oscar-winning actress Angelina Jolie (Maleficent) made her feature length directorial debut with the Bosnian war film In the Land of Blood and Honey. Amidst poor initial reviews and a plagiarism lawsuit, the film received a very limited U.S. release and, therefore, was considered a huge bomb. Getting right back on the horse, Jolie’s next movie is another war drama, the World War II picture Unbroken. Unbroken is the story of Louis Zamperini (Jack O’Connell from Starred Up), an Olympic long distance runner who competed in the 1936 games in Germany before enlisting in the US Air Force as a bombardier in 1941. While on a search-and-rescue mission in the South Pacific, Zamperini’s plane is shot down. Of the eleven crew members, only Zamperini and two of his crewmates, Phil (Frank‘s Domhnall Gleeson) and Mac (Finn Wittrock from “All My Children”), survive. After floating on life rafts for weeks, they are finally picked up – by a Japanese warship. The Americans are promptly sent to a POW camp run by a sadistic Japanese commander named Mutsushiro Watanabe (played by Japanese musician Miyavi, aka Takamasa Ishihara). Zamperini’s reputation as an American Olympian precedes him, and Watanabe makes his life inside the camp especially miserable. Louis and the rest of the American POWs struggle to survive the camp until they can be rescued…or they are killed by their captors. Unbroken is a bit of an enigma. On paper, it should be a great movie. The screenplay, based on the book by Laura Hillenbrand (who also wrote the book behind Seabiscuit), was written by the Coen Brothers (Joel and Ethan of Fargo and No Country for Old Men fame) with help from Richard LaGravenese (The Fisher King) and William Nicholson (Les Miserables). The story itself is compelling, starting off something like Rocky, zipping into Cast Away territory before ending up squarely in the land of The Bridge on the River Kwai. The cast is good, too, with O’Connell and Miyavi anchoring a very talented ensemble. There are even a few breathtaking action scenes, some of aerial combat and others of Olympic running, to get the viewer’s heart racing and blood pumping. However, even with all of these cards stacked in its favor, Unbroken still manages to fall short of expectations. 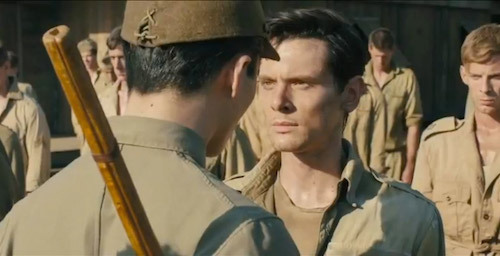 Despite its above average cast and well-crafted script, Unbroken fails to connect with the viewer on a personal level. While the exploits of the characters are sometimes fun to watch, there’s no real empathy. These men are locked up, not knowing if they’ll be killed or rescued, and all the audience feels is curious voyeurism; there’s no vicarious emotion. Unbroken is a character-driven movie without any character. It’s hard to discern exactly what the problem is, but one has to ask if the film would be more effective in the hands of a more experienced director. Angelina Jolie makes a watchable movie, but it has no stamp of personality to it, nothing to distinguish it from the rest of the World War II movies in the queue. Unbroken isn’t bad, it’s just not exactly memorable, either. For what it’s worth, Unbroken looks great. The film was shot by veteran cinematographer Roger Deakins (Prisoners, No Country for Old Men), and it’s got the same polished grittiness for which his work has become known. Deakins makes use of plenty of wide shots to give the film a bigger-than-life feel. During the portion of the movie where Zamperini and his crewmates are lost at sea, Deakins mixes huge panoramic shots that emphasize the vastness of the ocean with a few tasteful underwater sequences, complete with swarming sharks, which illustrate the dangers the heroes are facing. 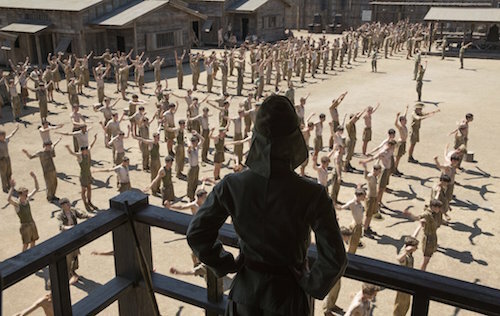 The scenes in the prison camp are suitably shot as well, with tight, claustrophobic shots that represent the Americans’ lack of freedom alternately combined with wide, sweeping runs that show the scale of the camp, letting the viewer know exactly how many soldiers are imprisoned. Roger Deakins does his job as director of photography well, making Unbroken look as stunning as possible.